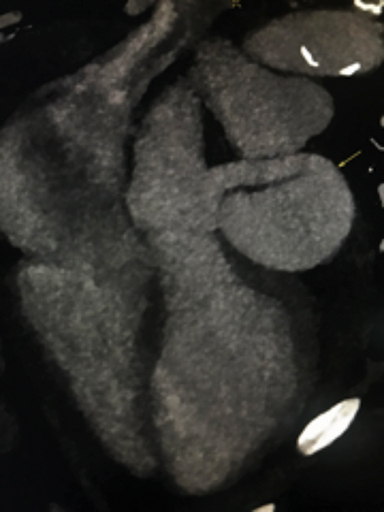 A 65-year-old man with symptomatic atrial flutter was being evaluated for an elective catheter ablation. Preoperative transesophageal echocardiogram (TEE) revealed incidental abnormal cardiac anatomy with aneurysmal dilation of coronary vessels. 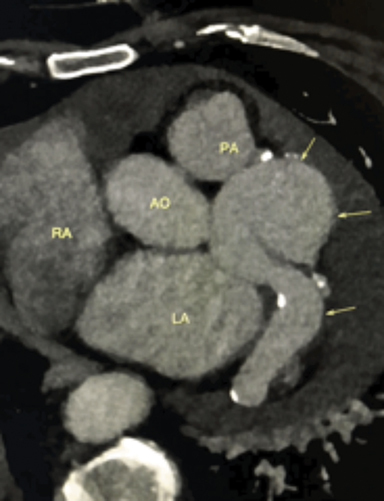 A cardiac CT angio gram (CCTA) was ordered for further evaluation. The CCTA was acquired with ECG gated retrospective in a 256 slice iCT (Philips) following IV 60 cc of Omnipaque 370 at 5.0 cc/sec. injection. Images reconstructed multiplanar and cMPR at 8mm thickness using iterative model reconstruction (IMR). 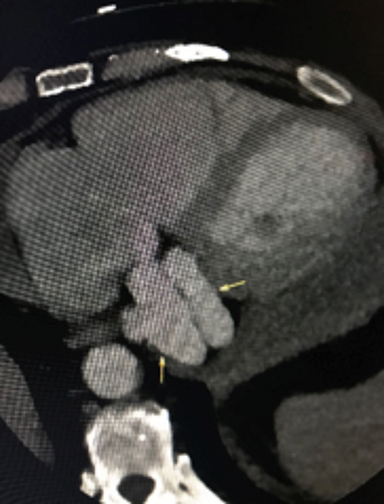 The CCTA demonstrates a large fistula between the proximal left anterior descending coronary artery (LAD) (Figure 1) and great cardiac vein (GCV). The left main coronary artery, LAD and GCV are aneurysmal secondary to the fistula. 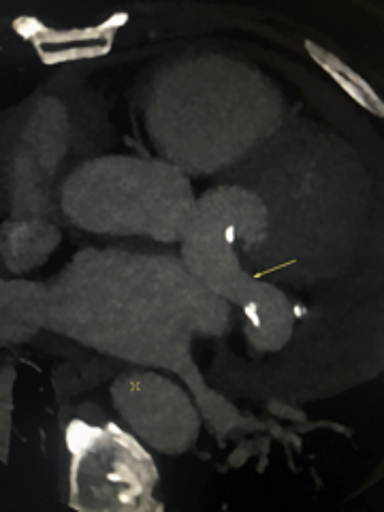 The markedly dilated GCV drains in to the coronary sinus (Figure 2) and contains multiple atherosclerotic spotty calcifications secondary to chronic systemic arterial pressure (venous arterialization). The left ventricular ejection fraction was calculated at 40%. There was visualized global left ventricular hypokinesis. Patient was referred for surgical consultation and fistula closure. Congenital coronary arteriovenous fistula (CAVF) is a rare anomaly present in 0.002% of the general population, which are often found incidentally during angiographic evaluation.1 CAVF may also be acquired. Zamani H, Meragi M, Arabi Moghadam MY, Alizadeh B, Babazadeh K, Mokhtari-Esbuie F. Clinical presentation of coronary arteriovenous fistula according to age and anatomic orientation. Caspian Journal of Internal Medicine. 2015;6(2):108-112. Ata Y, Turk T, Bicer M, Yalcin M, Ata F, Yavuz S. Coronary arteriovenous fistulas in the adults: natural history and management strategies. Journal of Cardiothoracic Surgery. 2009;4:62. doi:10.1186/1749-8090-4-62. Albeyoglu S, Aldag M, Ciloglu U, et al. Coronary Arteriovenous Fistulas in Adult Patients: Surgical Management and Outcomes. Brazilian Journal of Cardiovascular Surgery. 2017;32(1):15-21. doi:10.21470/1678-9741-2017-0005. Ghadri, J.R., Kazakauskaite, E., Braunschweig, S. et al. BMC Cardiovasc Disord. 2014; 14: 81. https://doi.org/10.1186/1471-2261-14-81. Gowda RM, Vasavada BC, Khan IA. Coronary artery fistulas clinical and therapeutic considerations. Int J Cardiol. 2006;107(1):7–10. Challoumas D, Pericleous A, Dimitrakaki IA, Danelatos C, Dimitrakakis G. Coronary Arteriovenous Fistulas: A Review. The International Journal of Angiology: Official Publication of the International College of Angiology, Inc. 2014;23(1):1-10. doi:10.1055/s-0033-1349162. Warnes CA, Williams RG, Bashore TM, Child JS, Connolly HM, Dearani JA, et al. ACC/AHA 2008 guidelines for the management of adults with congenital heart disease: A report of the American College of Cardiology/American Heart Association Task Force on Practice Guidelines (Writing Committee to Develop Guidelines on the Management of Adults with Congenital Heart Disease). Developed in collaboration with the American Society of Echocardiography, Heart Rhythm Society, International Society for Adult Congenital Heart Disease, Society for Cardiovascular Angiography and Interventions, and Society of Thoracic Surgeons. J Am Coll Cardiol. 2008;52(23):e143–263. Valente AM, Lock JE, Gauvreau K, Rodriguez-Huertas E, Joyce C, Armsby L, et al. Predictors of long-term adverse outcomes in patients with congenital coronary artery fistulas. Circ Cardiovasc Interv. 2010;3(2):134–139. Kiefer TL, Crowley AL, Jaggers J, Harrison JK. 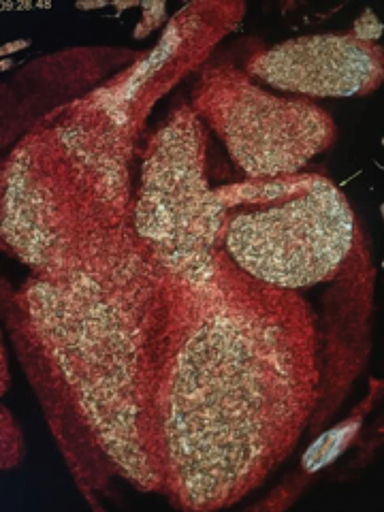 Coronary Arteriovenous Fistulas: The Complexity of Coronary Artery-to-Coronary Sinus Connections. Texas Heart Institute Journal. 2012;39(2):218-222. Sanchez A, Smuclovisky C, Lozier M, Lee J, Font V. Coronary arteriovenous fistula . Appl Radiol. 2019;48(2):46-47. Prepared by Dr. Sanchez, Dr. Lozier, and Dr. Lee while in the University of Miami at Holy Cross Hospital Internal Medicine Residency Program, Fort Lauderdale, FL; Dr. Smuclovisky while at the South Florida MedicalImaging Cardiovascular Institute at Holy Cross Hospital, Fort Lauderdale, FL; and Dr. Font while at the Jim Moran Heart and Vascular Research Institute at Holy Cross Hospital, Fort Lauderdale, FL.